This coming Saturday, along with many other book bloggers, I'll be taking part in Dewey's 24 Hour Readathon. Although I've been in and out of the book blog community for close to four years now, this will be the first time I've taken part in this particular readathon. After signing up for the event, I immediately got to thinking about my TBR. In previous years I've seen other bloggers with quite weighty TBR's, and whilst I admire them for that, that just isn't for me. The path I'm going down with my TBR is reflective of how I read and what I typically find to be page turning books. I also wanted books I knew I could easily immerse myself in as in general I'm not that great at reading for a bulk period of time - I'm very much someone who reads in short bursts. I don't know if my style of reading will help or hinder my readathon experience. So, on to the books - I know that's what you're here for! 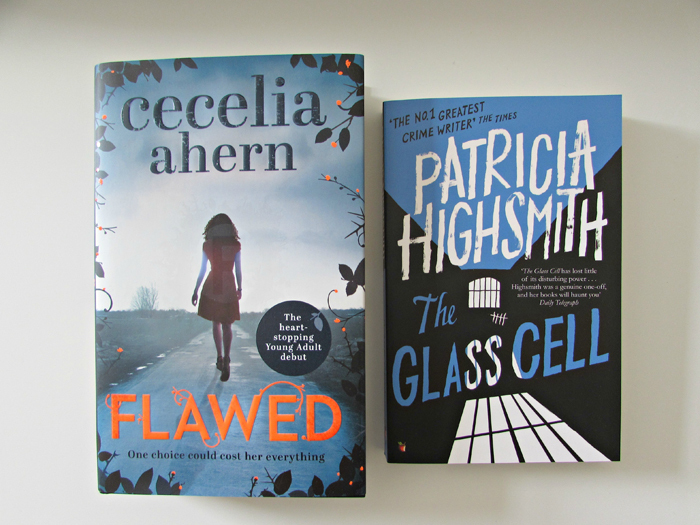 I have two main reads on my TBR - Flawed by Cecelia Ahern and The Glass Cell by Patricia Highsmith. Cecelia Ahern is one of my only auto buy authors; I really enjoy her writing style and can easily whip through the pages as her stories are always captivating. Flawed will be the book I start the readathon with and I'm keen to see how Ahern does YA. If I finish Cecelia Ahern's latest offering, then I'll be moving on to another novel of Patricia Highsmith's. I only started reading Highsmith's work last year, despite her being an author I'd wanted to read for quite some time, and since then I've read a few of her books with a couple more on my unread shelf. Two books could seem a little restricting for a readathon TBR, and I would agree. In case I need a bit of a breather, I have Volume One of Roald Dahl's Short Stories to dip in and out of. Regarding aims for the readathon, I'm going in pretty open minded with no specific expectations in terms of read time or anything - it would be nice to finish at least one book though. What's your readathon TBR looking like? All you need to know regarding Dewey's 24 Hour Readathon can be found here.